Architectural bollard designs by Nasatka bring environmental and aesthetic enhancements to any site, securing perimeter access without providing a sense of social disorder and active alarm measures. Built to last, Nasatka supplies crash rated bollards including K4, K8 and K12. Nasatka DOS K12 bollards are certified K12-L2 and are constructed with superior, quality steel. 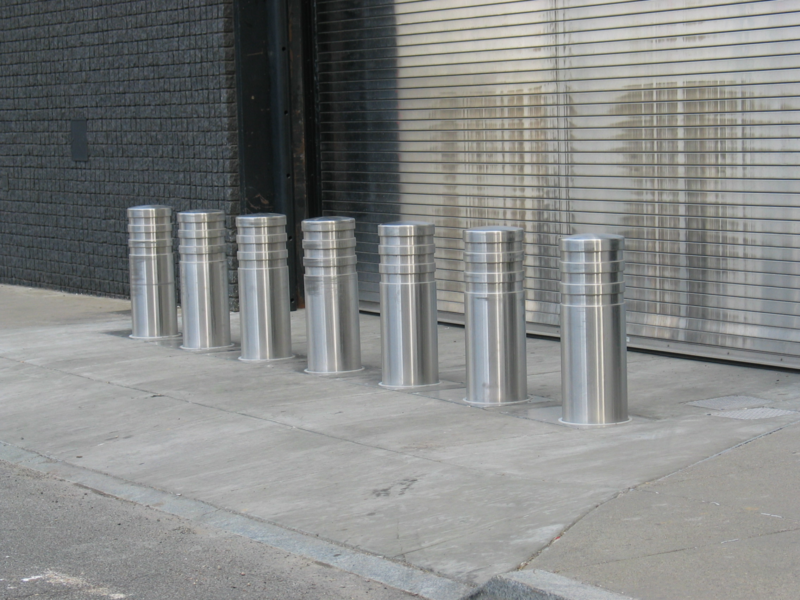 In addition, Nasatka Security is the only barrier manufacturer to include hot-dip galvanization steel as a standard feature, extending the durability of the bollard system. Nasatka bollard solutions stop unwarranted vehicle access and enable bi-directional stopping power, providing perimeter security access either as a stand-alone system or integrated with the most advanced of access control technologies. Nasatka is the first barrier manufacturer to offer two unique types of automated-hydraulic barrier systems. Traditional bollard barrier systems: sets of bollards to operate simultaneously by a single, remotely located Hydraulic Power Unit (HPU). Nasatka self-contained bollard system: incorporates a single gallon hydraulic power unit with each individual bollard to create a self-contained, self-operating bollard barrier system. Multiple bollard installations become non-reliant on any single hydraulic operating unit, permitting perimeter security to remain intact. Multiple units may be configured to operate independently or as a set barrier system. No external hydraulic lines are required for locations with close proximity to border roadways and no place to position a remote HPU enclosure. In addition, a battery-operated system is available to operate up to 100 cycles without the aid of external power. Nasatka has a bollard solution to thwart any perimeter security, vehicle threat. Automated Hydraulic Bollards: Traditionally a three bollards /set system is required to secure an access width of 12 – 16 ft. Versatile configurations are available by Nasatka engineers. Properly maintained, Nasatka hydraulic bollards may be continuously operated for maximum access control conditions requiring deployment of the system after each vehicle entry or exit. Manual Retractable Bollards: Nasatka can provide operating systems based on the customers’ needs beyond that of the standard accumulator based system. The manual bollard is the same design as the automated version. Removable Bollards: This system restricts vehicle access as threat levels require, permitting security for occasional and emergency access. Removable bollards require less foundation depth and various methods of removal have been designed. Permanent Bollards: Provide fixed perimeter protection when vehicle access is not a requirement. These are often installed as part of complete system integrated with hydraulic or manual vehicle access control barrier systems. Modernly designed in security planters, they provide aesthetic solutions for crash rated perimeter protection. Typical bollard applications include but are not limited to: Government agencies, military bases / barracks, law enforcement facilities, commercial office buildings, parking facilities, financial institutions, hospitals, public and residential driveways, correctional facilities, pedestrian areas, sport stadiums or wherever perimeter security and safe environments are priority.